Hi everyone! I am at Venexia, a Gothic Venice roleplay sim. I don’t RP, but I was able to visit this sim by wearing a visitor’s tag (touch a sign near the gondola for one). 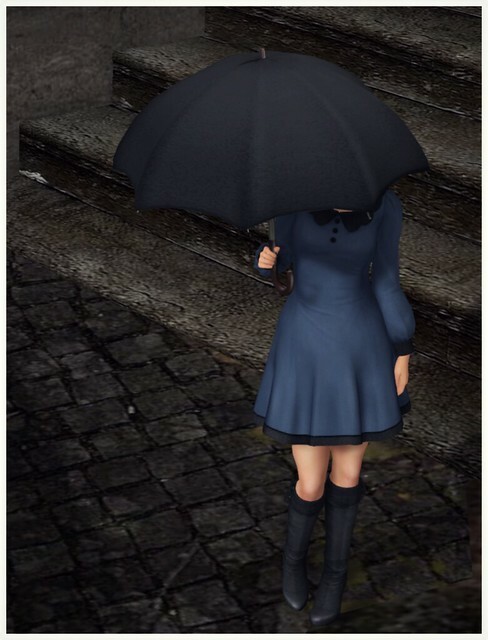 I fell in love with the new Vivian dress from G-Field, and chose it in Winter Sky Blue, with Black accents. I think the outfit really suits the dark mood of this sim. I still haven’t taken off my mesh hands from SLink! If you guys liked my review, you should also check out Iris’ review over at NWN. The textures on this dress in-world are so beautiful, I love it.